Doing elapsed time calculations has never been easier! 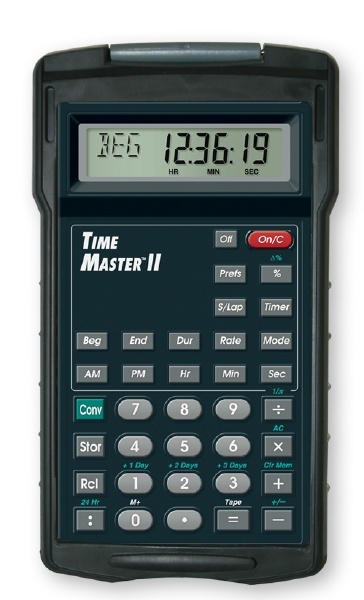 Now you can use the Time Master II to calculate elapsed time in AM/PM and Military Time formats. It's great for scuba divers, pilots, or calculating the elapsed time of other events. Enter the start time 7 : 1 0 AM and press Begin. Enter the end time 2 : 2 5 PM and press End. Press Duration and the calculator displays 7:15:00. Save the result to memory (for later addition) by pressing Stor. Convert to decimal hours by pressing the Hr button, and it displays 7.25 hours. Add in the first value 8 Hr and press +. Add in the second value 72 Min and press +. Add in the third value 12 : 25 and press =. Displayed Time = 21:37:00 Hr/Min/Sec. Press Timer to place the calculator in timer mode. Enter the Coundown start time 1 Hr. Start the countdown by pressing Timer. Pause the countdown by pressing Timer. Restart the countdown by pressing Timer. The time for multiple elapsed time durations can be added together. Time can also be subtracted. Built in stopwatch with buzzer. Calculate time difference between times. Free Armadillo® Gear protective hard case. Pilots and flight attendants can track hours on duty to prevent exceeding maximum flight hours. Aircraft flight log calculations (flight time / flight hours calculator). Television and broadcasing professionals can use the elapsed time timer and stopwatch for editing and production. Coaches can use the audible stopwatch timer for athletics applications. Medical professionals who have to track elapsed time for blood plasma and vaccines. Dive supervisors and support crew who have to fill out divelogs with diver in / out times, water times, and bell / habitat times. Click to see a comparison of time calculator functions offered by the Time Master II and TimeCard Tabulator II time calculators. Internet orders are accepted 24 hours a day via the "Add to Cart" button above.